Baby Babble 3 - T, D & N. Baby Babble(TM) is an award-winning series that engages babies, toddlers, and beginning talkers with fascinating toys and charming music while introducing age-appropriate speech and language concepts, facial exercises, and sign language. 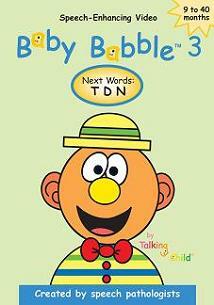 Created by speech-language pathologists, Baby Babble (TM) 3 focuses on the developing sounds: T, D, & N.
Why T, D, & N? These are a few of the early developing sounds that young children learn to say as they are beginning to talk. The sounds P, B, & M, were introduced in Baby Babble™ 2. These bilabial sounds typically develop first and are articulated using both lips. The newest addition to the video series, Baby Babble™ 3, introduces the next developmental sounds: T, D, & N. These alveolar sounds are produced when the tongue touches an area located at the top of the mouth called the alveolar ridge. Created by speech-language pathologists. Our mission is to teach parents how to promote speech and language at home.